To meet the diverse requirements of clients we are involved in offering Motor Design Software. Our offered motor design software is available with different updated versions. 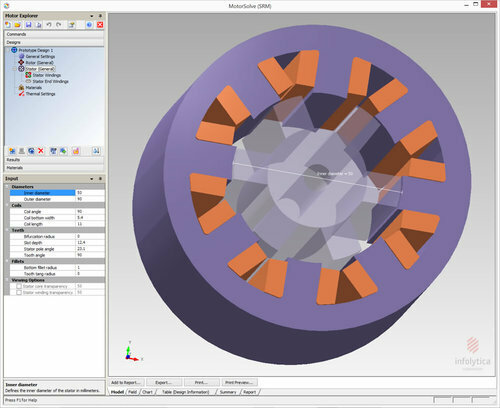 At vendor's end, the offered motor design software is precisely designed & developed using the latest technology. Also, this software is provided in various modules to suit the varied requirements of our clients. Came in existence in the year 1994, we, Macc Enterprises, are among the prominent traders and exporters of a wide range of supreme quality Electronic Instruments & Software. The product range offered by us is inclusive of Motor Design Software, Growler Short Testers and Power Analyzers. Due to their minimum power consumption, user-friendly operations, longer functional life and compact design, these digital electronic instruments are highly demanded in the market. In addition to this, we are engaged in offering supreme quality Job Placement Services to our valuable customers. Due to its effectiveness, these services highly appreciated among our customers. We export our products to UK, Germany, Middle East Countries, France, Italy. We have been able to cater to a huge clientele across the globe owing to our ability to meet the bulk demand, customer centric approach and total transparency in all the business dealings. NGEF, MBH and Waterman are some of our valuable customers associated with us over a long period of time. For the ease of our customers, we offer different modes of payment.